When complete in the Fall 2017, this 142 room limited service hotel will sit on just under an acre of land and include 78 double, 58 king, and 6 ADA accessible guest rooms. A detached 3 level garage capable of accommodating 110 vehicles with be connected to the hotel by a porte cochere canopy. A 22,887 square foot amenities deck located atop the third level of the hotel will feature a resort style pool and fitness studio. 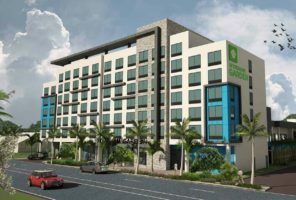 In addition to back-of-house offices, workrooms, housekeeping, storage and guest laundry areas, the hotel will include a business center, a meeting room, gift shop, lobby bar and breakfast food service area. The 7 story hotel, which will be supported by spread footing foundations, will consist of a block and plank structure, varied gray and blue paint accents on scored stucco, dynamic blue exterior cladding, simulated stone panels, full height storefront at street level, and fixed blue gray non-reflective glass with black plastic louvers. A single ply TPO roof with rubber membrane, PTAC mechanical system, energy efficient lighting and controls and (2) 350 FPM traction elevators are also included. As construction manager, Craft provided several months of preconstruction consulting services that resulted in $500,000 of accepted cost savings options. The project, which is scheduled to be complete in just 14 months, will require extensive planning, coordination and meticulous sequencing to ensure safe and uninterrupted conditions to adjacent properties.